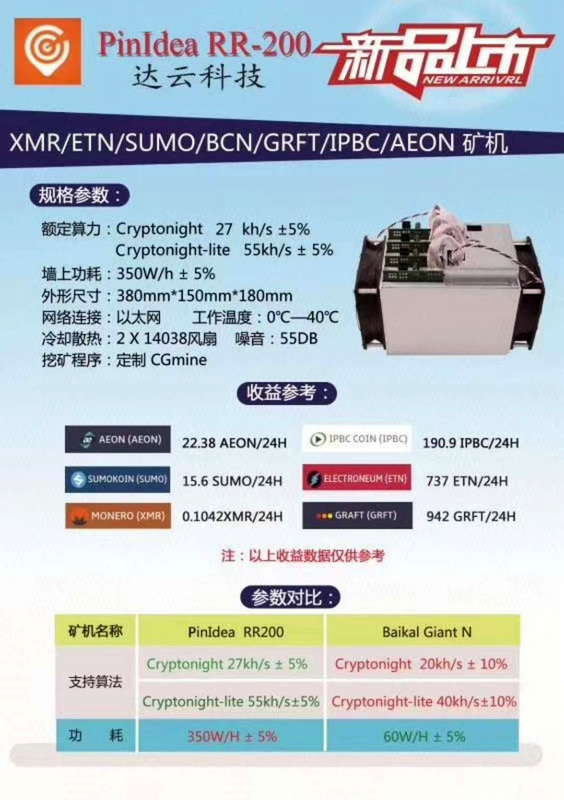 It seems that everyone is releasing Cryptonight ASIC miners out of the blue, there is information and websites in China starting to offer PinIdea RR-200 Cryptonight ASIC miners that are promising 27 KH/s Cryptonight and 55 KH/s Cryptonight-light mining performance at 350 Watts of power usage with a price similar to that of the Baikal Giant-N. So the RR-200 promises a bit faster hashrate and comes at pretty much the same price and shipping immediately directly trying to compete with the Baikal offer. Unfortunately at this point it is hard to confirm this new miner for sure as the official PinIdea website seems to be down and there is no info on their official Facebook page about a new Cryptonight ASIC being released, so treat this information with caution! Meanwhile another ASIC manufacturer, Halong Mining, has tweeted that they are also planning on releasing a Cryptonight ASIC, though they have been busy lately with miners for other algorithms. The Bitmain Antminer X3 was also recently announced, though it will be a while before their much more powerful devices start shipping. At the same time crypto coins using the Cryptonight algorithm are talking about forks and switching to a new ASIC proof version of the algorithm that can make all of these ASIC miners obsolete with Minero (XMR) leading the way. That is probably why more ASIC manufacturers are trying to push hardware to users that might have been mining for them for a while and are now trying to sell it as fast as possible before it becomes useless. So a word of warning – be extra careful and plan well with Cryptonight ASIC miners! Jig is up… People can’t mine in private anymore so they’re trying to get rid it their hardware.